Does your company have a professional looking piece to hand out or mail to a perspective customer? Perhaps a brochure or booklet with information about your company as well as its services and specialties? What about business cards, direct mail pieces, letterhead and envelopes? Are they professional in appearance? If you are looking to create new marketing materials or just want to update your existing materials, HatchWorks can provide high-quality design that will be effective for getting your message across to your customers and potential customers. HatchWorks designs are not only creative and professional in appearance, but are also designs that make sense for the business/product. We understand that you don't just need a great looking piece, you need a piece with compelling content that will help generate new or keep existing customers. The design elements incorporated into any marketing piece need to make sense... not just fill the page or give you a warm fuzzy. Whether you're looking for one-color business cards, a 2-color brochure, a direct mail postcard or a full-color booklet, HatchWorks can design a professional, polished piece... and with a quick turnaround. There are many options to choose from when deciding what type of marketing piece will be best suited to your target market. What I find important for most companies is to have a company brochure that describes who you are and what you do. Depending on your business you may want to have a well designed and educational leave behind piece. This could include a brochure or booklet describing your services as well as a specials flyer, your business card... all wrapped nicely in a presentation folder. Of course all these pieces should be designed with consistency which can help with your company's branding. Have a project in mind?... click here for an Online Quote. We have extensive experience in designing direct mail publications... especially shopper advertising publications. If you are in need of this type of design please give us a call. 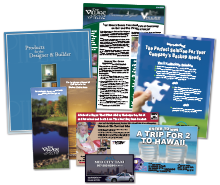 We have been producing direct mail publications and meeting deadlines for over 20 years. We can provide top-quality design and produce designs with quick turn-around and unmatched service. So whether you may be looking to have all of your design work handled or just need help during your busy times, we are available to help you meet your deadline. If you are the owner or manager of a restaurant and you are looking for design for your in-house menus, take-out menus, direct mail postcards or in-store signage we can certainly help you. We have produced hundreds of these types of pieces for restaurants across the United States. We pride ourselves in producing great-looking and easy-to-ready menus for your customers. If you are looking for an original design to your restaurant's menus or marketing pieces please give us a try. Click here if you would like a quote for your menu or other restaurant design needs. If you are looking to do a direct mail marketing campaign we can help. HatchWorks can not only design your direct mail marketing piece, but can also help you get it mailed to your target market. Whether you are looking to send a postcard, newsletter, booklet or other type of direct mail piece, HatchWorks can design a compelling marketing piece that will get noticed, and if you choose we can also procure a mailing list, specific with your target audience in mind, and get your pieces mailed for you. Click here to learn more about direct mail, or Click here if you would like a quote for direct mail. 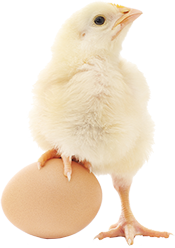 What desgin ideas can we hatch for you?